Recently playing High Level Challenge's indie-hit Blade Buster didn't only remind me of the classic Hudson Soft Star Soldier franchise, but also of a more recent 2003 homebrew offering, namely Super Star Shooter Advance from Magic Touch/The Dotmap Brothers. Based on the X68000 original, this relatively unknown GBA conversion hasn't lost any of it's charm or playability over the years. The screen obviously feels a little cramped in comparison to the X68K version, but if (like me) you still have a GBA or DS and a flashable cartridge available then there's still a lot of fun to be had with this little game. My opinion has always been that portable video games should offer a short and sweet experience, and games like the RGCD acclaimed Blast Arena Advance and SSSA are perfect for those occasions when you've got a few minutes to kill. 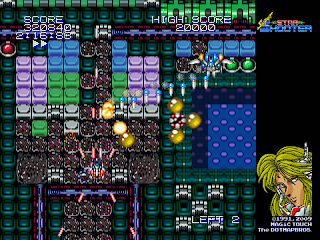 Fast loading and with each game lasting a maximum of two minutes (or shorter if you run out of lives first), Super Star Shooter Advance is an excellent Caravan-style score-attack shooter that is just perfect for when these opportunities arise. There are hundreds of enemies to dispose of, bosses to battle, destructible scenery, power-ups and multiple score bonuses to collect, all wrapped up neatly in a small handheld package. Sure, retrofitted with low-colour X68K graphics it may look a little dated, especially when compared to the professional new-school pixel art in High Level Challenge's similar offering, but there are some nice features here that I'd like to see more often, such as the way that the game displays the highest scoring play-through as a demonstration replay when the game is left idle. As a final note, whilst researching details for Magic Touch I was happy to see on their website that they are still coding and have in fact recently released an enhanced Wii version of Super Star Shooter. Unfortunately I don't have the hardware here to test it, but if the quality of SSSA is anything to go by Super Star Shooter on the Wii is probably well-worth downloading. Download the game here (from the Magic Touch website).